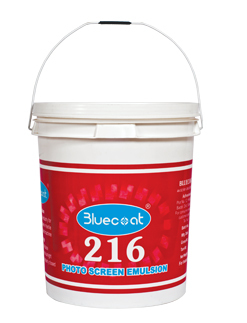 Bluecoat 216 Emulsion is used for applying on the sides of the screens for flatbed & table screen printing to avoid cracking in the screens. There will be no leakage from the sides of the screen hence save usage of adhesive tapes. The sides of the screen will be strong enough to withstand the pressure of squeeze. There would be no need to use lacquers, hence saves cost of lacquers & thinners. The screen dries faster compared to lacquers, which saves time. 10 kg & 25 kg plastic bucket.